Bring a touch of elegance and sparkle to your stairs with our high-quality LED stair lights. Suitable for most types of property and designed with reliable performance in mind, we supply premium LED lights for all purposes. Use stair LED lights to enhance the appeal of homes, businesses and public buildings alike. Whether looking to improve safety or simply take aesthetics to a higher level, LED lights for stairs really can make all the difference. Explore a wide variety of bright, colourful and dynamic LED stair lighting from a team of experts you can count on! LEDs make the perfect choice for staircases for a variety of reasons. Along with being uniquely discreet and easy to install, LED lights on stairs are also incredibly durable and hardwearing. Meaning that even in the most active of households and buildings, you can count on LED lights to go the distance. LEDs have been used for decades as a means by which to bring additional safety to staircases of all shapes and sizes in every imaginable setting. These days, LED staircase lighting is just as much about style and sophistication as it is about health and safety. 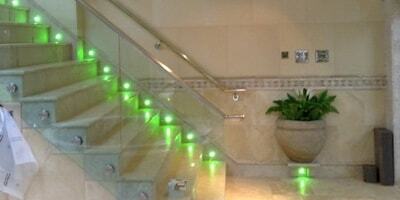 Our LED strip lights for stairs can be personalised in a variety of colours, designs and specifications. What's more, many of our bespoke staircase LED lighting systems are fully dimmable, meaning you can have them as bright as you like when necessary and turn down the illumination at other times. LEDs have the potential to reduce energy consumption quite extraordinarily - even more so when dimmed to a lower level of brightness. And for even greater versatility, we offer a wide variety of custom LED stair light systems that can be operated by remote control. Turn them on, off and operate dimming function at the touch of a button! As part of our bespoke lighting system design services, we can also provide you with innovative motion sensor stair light LEDs. When it comes to practicality, safety and minimal energy consumption, nothing beats automatic recessed LED lights for stairs. These robust and reliable systems can be trusted to automatically activate when an individual approaches, subsequently by activating when they have left the vicinity. An outstanding option for use in public buildings, not to mention all types of homes and businesses across the board. For those looking to get the job done manually, we can provide the kind of simple yet effective stair LED lighting products that can be installed in no time at all. With no specific skills or experience required, your staircase LED lighting can be up and running with minimal effort. Of course, our in-house team of experts is available at all times, should you have any questions or queries regarding the installation of LED stair lights. To learn more about any of our products or to discuss placing an order, get in touch with a member of the Fibre Optic FX customer service team today.